This article first appeared in the San Jose Mercury News Winter 2012/2013. LIGHTS: You don’t have to invest in high-priced pieces to keep holiday lights organized. Holiday lights can be easily wound around a piece of cardboard. Cut small inserts into opposing ends of a rectangular piece of cardboard, and slowly wind the lights around. You may need to adjust the depth of your cuts. With a permanent marker, label the lights’ location directly onto the cardboard’s edge (i.e. outdoor over garage, indoor tree, etc). ORNAMENTS: Pack ornaments away in small labeled boxes or plastic tubs. Wrap your ornaments in paper or bubble wrap – REUSE these packing materials every year! 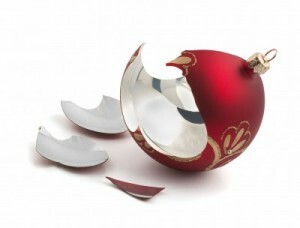 Put all fragile ornaments in one tub – line this box with bubble wrap, and mark ‘Fragile’. As you pack up the ornaments, if you see one you are unattached to donate this item to a home or organization that will enjoy it. UN-DECORATING: Spend the same amount of quality time un-decorating as you did decorating. Use the time un-decorating to share your favorite stories of this year’s holiday season. Un-decorating should be as fun and memorable as decorating!